We are in the Philippines because of Sora’s vocation as a midwife, but I have long realized that I need to be teaching in order to be happy. I am a classicist, the son of two classicists, and the brother of a classicist. Teaching Greek and Latin languages and literature is the family trade. It is very fulfilling and satisfying for me when I can do it. When we first considered becoming missionaries, I told Sora that I was willing to do it if I had a place to teach. Faith Academy was the first “place to teach” that I found, but God clearly also has other plans in bringing me here. 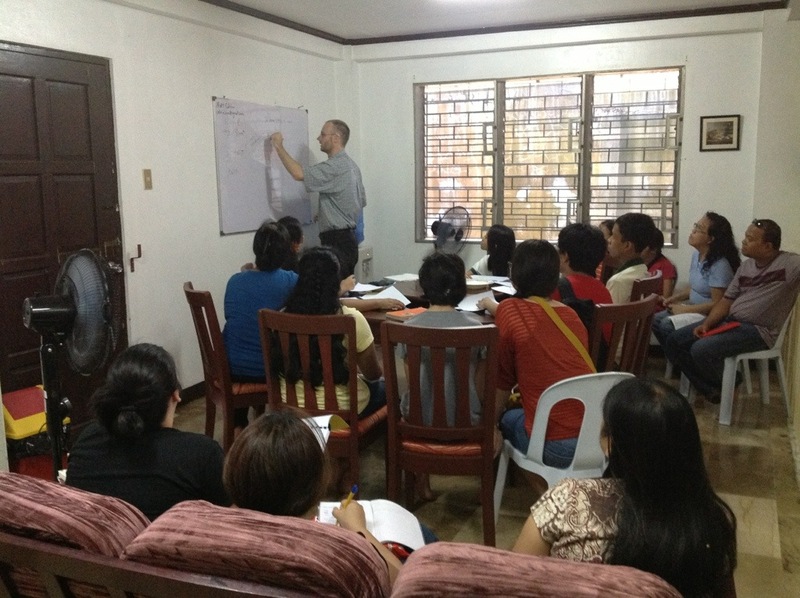 This Tuesday, a small crowd of Filipino homeschoolers crowded into our kitchen, where I had installed a whiteboard. I distributed copies of Hans Ørberg’s marvelous textbook, Lingua Latina Per Se Illustrata, and we began. These homeschooled students are very bright and they ask great questions. For any former students reading: Yes, there was homework the first day. And yes, there will be a quiz at the second meeting. The flashcards for the class are available at Quizlet.com. I will take the students as far as I can in the time we are here. I hope that that will mean reading Ovid or Vergil together eventually. Certainly we will be able to do some of the Vulgate. We’ll look at medieval manuscripts and inscriptions, too. This is an exciting development in our life here in Davao. It gives us a way to cultivate relationships and share resources with the local homeschooling community. It takes us further out of the American missionary “bubble” so that we can more fully manifest the unity of the body of Christ with our Filipino brothers and sisters. I’m doing my best to explain Latin grammar by comparison both with English and with Bisaya. I spent last week traveling with another missionary in northern Luzon (the largest of the Philippine islands.) We visited Georgia Macad’s charity lying-in clinic in Tabuk City and the sister clinic started last year by her friend Crystal in the much smaller village of Bugnay. 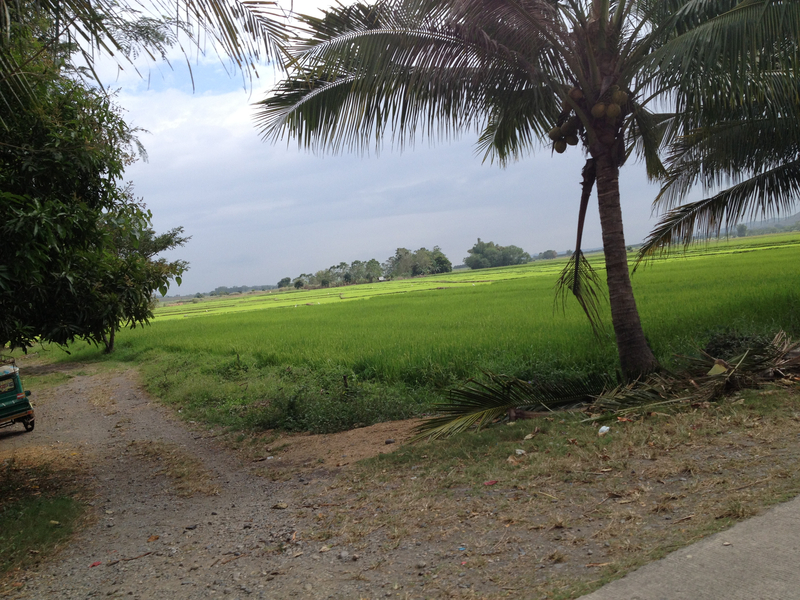 The clinic in Tabuk City is surrounded by rice fields and palm trees. Though the trip was exhausting in some ways (we were “on the road” 5 days out of 7, traveling variously by air, tricey, taxi, bus, and jeepney) it was also a wonderful opportunity to see another part of the country and learn more (much more) about the workings of a smaller and newer midwifery mission work than the large and longstanding one I am part of in Davao City. Georgia’s clinic is 6 years old and currently has 20-15 deliveries a month compared to 120+ in Davao; Crystal just started her clinic a year ago and serves women in 5 tribal villages that can only be reached by steep footpaths through the mountains. I greatly enjoyed my time visiting with both of them. 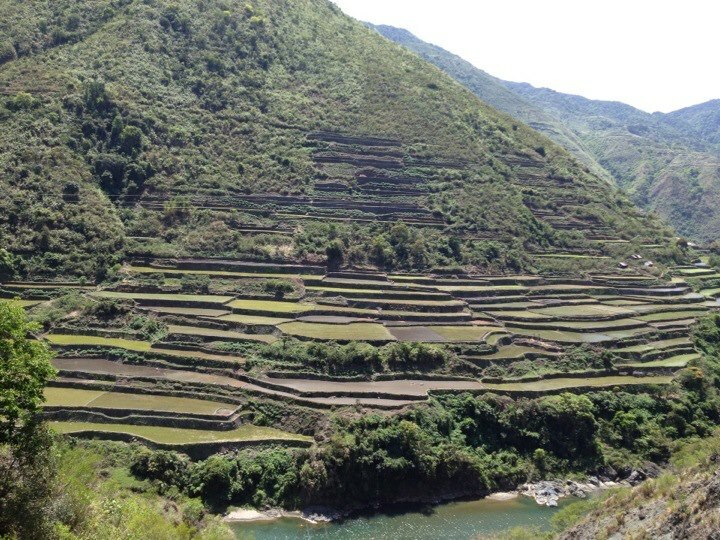 The remote, terraced slopes of Kalinga province must be some of the most beautiful scenery anywhere. Photo by my traveling companion HB. Still limber and practicing her craft with skill and finesse at the age of 92. Photo from the camera of my traveling companion HB. The traditional tools: charcoal and a calamansi thorn. Photo from the camera of my traveling companion HB. Our ride to Bugnay was on a bus and though the scenery was memorable, aside from some brief excitement when I dropped my phone out the window taking a picture (the driver stopped and I retrieved it) it was an uneventful trip. On the way back to Tabuk, we took a jeepney and rode on top (more comfortable and a better view than inside.) We certainly had an amazing view but it wasn’t always reassuring to be able to clearly see the condition of those steep mountain roads with their hairpin turns (often unpaved and frequently only one narrow lane, with regular evidence of recent landslide damage!) It was a bit like a very long and very beautiful roller-coaster ride. Eventually I stopped gripping the rails with both hands so that I could take photos and video footage. If you can get it, I highly recommend freshly fried banana lumpia from a roadside stand, eaten on top of a jeepney on a mountain road in Kalinga province as just about the best breakfast ever. 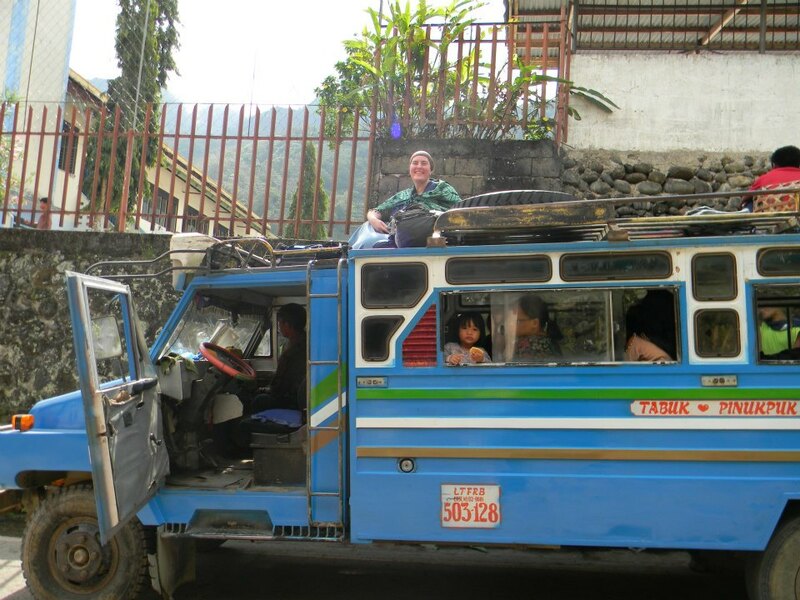 At a rest stop: riding on top of the jeepney on the way back to Tabuk from Bugnay. Photo by my traveling companion HB. I intended to write at length as soon as I got home and to post many, many photographs (I took over 300 photos and half a dozen video clips while in Tabuk and Bugnay) but on our return journey, something happened that made that much more difficult. My friend and I had just made the return flight from Tuguegarao (the closest airport to Tabuk) to Manila, arriving shortly before 3:00 pm. We took a taxi to the guest house where we were spending the night before our return to Davao the next morning, dropped our luggage in the room and then, as we had not eaten since breakfast around 7 am, decided to visit the Mall of Asia to get some lunch. As we walked toward the main street two men riding tandem on a motorcycle sped past us, and the passenger grabbed the strap of my purse off my shoulder as they passed. I had just bought the purse in Tabuk a few days before: it was made of handwoven Kalinga material, had a long shoulder strap, and was just big enough to hold my wallet, iPhone (containing all the photos I had taken during the week), and passport. It was broad daylight, the street we were on was quiet but not deserted (in fact a police car had driven past just a few minutes before the snatching.) I was talking to my friend and not particularly alert for trouble, but as always when walking I had the strap of the purse looped around my wrist and hand. Everything happened so quickly I had no time to process what was going on. I yelled, hung on desperately to the purse strap, and was pulled to the ground and dragged behind the motorcycle. The stitching holding the strap to one side of the purse snapped and the other end of the strap was burning the skin off my finger and thumb as my legs scraped along the pavement. I reached up with my other hand and grabbed the back of the snatcher’s shirt — my only clear visual memory of the thieves is a handful of black fabric — and he let go of my purse strap. The broken strap was immediately entangled in the wheel of the motorcycle and I could not physically hold on any longer, but lay in the street, badly bruised, watching my friend running screaming after the motorcycle, and unable to believe what had just happened. The two men never stopped or looked back, even when a security guard they passed drew his gun and shot after them. They turned the corner and disappeared into the thick Manila traffic. In retrospect, I was very fortunate not to have been badly injured or killed. We spent the next several hours checking security camera footage in the barangay hall (though the motorcycle spent several seconds on camera, the license plate on the had been tilted so that it could not be read) and at the police station. The barangay officials and the police were uniformly respectful, sympathetic, and attentive. Unfortunately, there was very little that they or we could do. Two men on a motorcycle in Manila, identifiable only by the color of their t-shirts? Might as well look for a particular piece of sand on the seashore. Given the circumstances, the purse might possibly have dropped (once friction broke the strap) and been run over before the thieves even realized it was still attached to the wheel. Matt, back in Davao, called the banks to cancel all our credit cards, faxed a copy of my passport to the police station (this and the police report allowed me to fly home the next day) and attempted to remotely lock my iPhone. I had not chosen to pay for a data plan for the phone, reasoning that I only really needed internet access at home. This bit of frugality made it impossible to get GPS coordinates to track the phone unless someone logged it into a wifi network. Four days later, I’m still figuring out how to pick up the pieces. Luckily Matt’s ATM card had a different number than mine, so we are not completely cut off from access to our money (good thing, since rent is due this week!) but we’re not sure how long it will take to replace our credit cards. Getting a new passport will take about a month and will require another trip to Manila to appear in person at the US embassy. We’re not sure when and whether we’ll be able to replace the iPhone, which I used constantly for everything from currency conversions to Visaya vocabulary practice, but especially for taking pictures for our facebook page, newsletter, and blog. 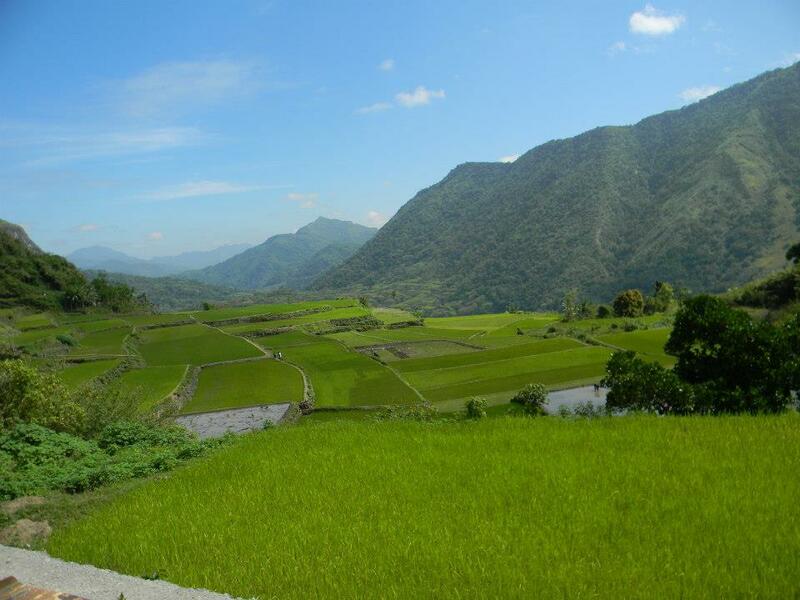 And of course all the photos and video footage of my trip to Kalinga provice – with the exception of a handful pictures I’d loaded to Facebook from a very slow connection in Tabuk – are gone forever.